1. Listen to it. Each track is less than 9 minutes long (we did that on purpose). For example, “Debrief your projects, events and the week” is just over 5 minutes and gives you solid advice on how to learn from this week, and go into next week prepared and ready to succeed. 2. Copy it to your iPod (mp3 player). From time to time, you’ll arrive on time to a meeting, and no one else will. (There’s a tip on that on the CD!) When that happens, listen to a track one more time, get an idea, and implement it when you get back to your desk. As the plane was crashing, here is what Ric Elias learned. Link here: three things that Ric Elias says he learned on January 15th, 2009. Is your mind already made up? For the "worst"? I'm planning a life-long, dream trip to visit Normandy, France. I will arrive in Paris on 4 June, and make my way toward the coast. Since teaching high school history (starting in 1995) I have wanted to be in this area of the world on an anniversary of D-Day, June 6th. And now, I'm going to take this trip. Over the past month, I've been scheduling tours, renting cars, and finding places to sleep. I got this email, and debated whether or not to share it, but in light of who I am, and what I do...I feel the need to talk about it to you. I sent a note to 7 different bed and breakfast owners/managers in and around Bayeux, France. After explaining this trip I'm going to take, I wrote, "Might you have a space available for me to stay starting the 4th of JUNE? I will be staying just 4 nights (checking out on 8 June, to fly back to California)." Here is one response I received. you could not pick up a worst period. i don't think you will be able to find any accommodation nor guides. Can you pospone your visit after the D-Day ceremonies period? 1. Ahhh, yes monsieur, you're right. I will cancel this trip. 2. Oh, yes, just another Stupid American. 3. Hmmm, kinda sounds like a challenge. 4. Say WHAT? Give up? Now? When I'm SO close? 5. (and, the one I choose to think) I am confident that SOMEone in Normandy will (1) help me find a place to sleep, and (2) talk to me about what happened on that day, 6 JUNE 1944. I thought a lot about whether or not to share this experience/story with you. And, here's why I did it: I think we ALL need to think bigger. I also think we need to help each other out ... just a little bit. So, in the spirit of service: How can I help you? Please do let me know! Do you start each day with a plan for action? Most people do. Whether they make a to do list or leave emails in their inbox to work on throughout the day, they have some way to manage their tasks and projects. Each day, however, we manage more than just time. We manage conversations, meetings and interruptions. 1. Arrive early – to meetings, airports, appointments, to the office, etc. When you arrive early, you are refreshed and relaxed. Instead of scrambling at the last minute and being stressed out from traffic, delays or other “unscheduled” surprises, you will be able to find a place to sit down and perhaps even review the meeting materials, or read something you have been waiting until you had time to read. This sets you up for success. You have a cushion of time if there is a delay or if you arrive early and can get something done (see tips below). 2. Make fewer agreements. For the next 5 business days be sure to write down each and every thing you say you are going to do…and, what others say they will do for you. Once you have this complete inventory, prioritize the ones that are the most important and start to renegotiate (or eliminate) the rest. One way to manage your agreements most effectively is to use some kind of Promise Guide (http://www.thepromiseguide.com) so you can visually see all you have to do and track your progress over time. The more items you complete, the better able you will be to manage all your actions and tasks. Then, slowly and over time, make fewer agreements, but make sure they are the most important ones! 3. Ask for assistance. Sure, at one time (in university, especially) it was very important to be able to work by ourselves, and demonstrate our capacity for productivity. However, now in an era of uber-connectivity (http://www.linkedin.com/in/jasonwomack) it’s very important that we recognize the experts in the world and reach out to them for assistance. Often, these people are just an email (or even a phone call!) away. Reaching out to ask someone for assistance will save us time, and expand our community and network. As we head in to another decade of a considerably flattening world, it’s going to be more and more important that we know WHO we need to know so that we can do WHAT we do better. For the next few days, consider testing these new habits. They probably won’t form themselves overnight, but practicing with them will give you some ways to improve your productivity, one day at a time. The content of this post is based on my upcoming book (January 2012): Your Best Just Got Better: Think Bigger, Work Smarter, Make More. In one of the chapters in the section “Work Smarter,” I write about the significance of Tracking…being aware of what you do during the day, so you can do it more effectively/efficiently. There are three things I would recommend you start tracking during your work day. Start by picking just one of these, for the next week. At the end of 5 days (yes, another Five Day Experiment!) you can Identify any areas that need more (or less) attention. If you can make the Webinar, I’ll talk for a bit about each one of these. If not, I’ll give some hints below. It's this kind of stuff that makes me sit back and think..."Hmmmm, what could we do, if we did what we thought? If some idea I have could help someone learn, grow and lead, how could I get it out there?" Years ago, a mentor of mine gave me this advice over a lunch discussion. I remember we were talking about time management (I brought this problem to him because I saw it as my major issue in not producing what I had been intending to work on…). This advice is directly responsible for my philosophy of Workplace Performance. That philosophy, as I frame it in presentations I give in Europe, South America and (up to now) in 46 of the 50 United States, is: Be, work, and live at your 100%. It is very important to note, here, that I define work in the most general of all senses. Being an effective coach, delivering an important speech, reading a great novel, watching a funny movie, going out for dinner, racing a triathlon…it’s all “work,” it is just that I don’t get “paid” for some of it. It all takes effort, resources, and time to think about, set up, and do! Ready. Set. Go! Products to make more productive days. Jason presents 15 powerful and simple tips that each will give you up to 15 minutes of “free time.” No lofty promises, no theoretical jargon, just the power tools of productivity. This valuable training course radically improves your effectiveness in personal productivity and workplace performance. This elite corporate training CD gives tips and techniques to maximize your time, energy and focus allowing you to exceed your expectations. Get an “upgrade” to your current system by learning ways to make Outlook work for you. Make the most of the features, learn the secret to unlock this powerhouse program. You’ll wonder how you ever managed using it before this document. Over the next month, I'm building up a little project and I'm asking for your help. 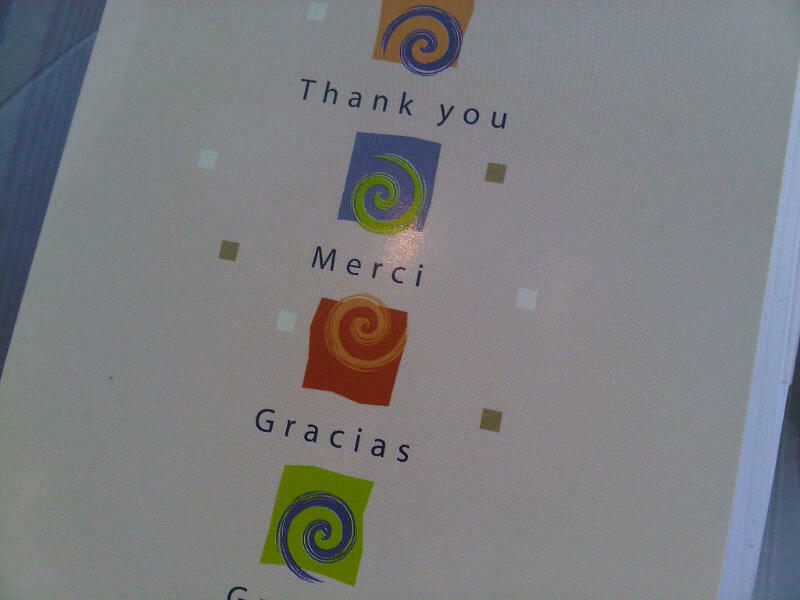 I would like a picture of you holding a thank you card. Please send or email it to me with a short note of thanks to someone important, special and/or influential to you. Timeline: Did we adhere to start dates, milestones, deadlines, and deliverables? Where and when were we ahead of schedule? Behind schedule? Roster: Who had responsibility for which roles? What was outsourced? How did each person do? What did we learn from our involvement in the project? Checklists: What supplies & materials did we use? What did we need? What did we not need? What will we need the next time we do something like this? Risk assessment: What were the big(gest) risks we took? Did we take enough risks? Were there surprises we did not anticipate? How did we handle them? Did You Know you can learn about productivity,leadership, resource management, and teamwork at the conclusion of a project?